There’s my boy in the wake of desertion when his sister left for Joy School a bit ago. I could tell you about the uncommonly strong bond between them and how sad he was that she’d left him and he was attempting to unlock the door so as to run lovingly and loyally after her. But that would be a lie. 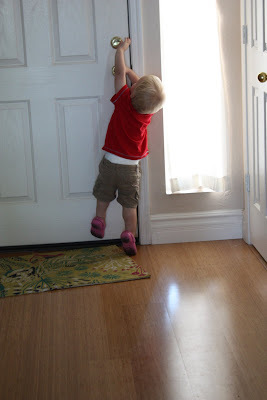 Her leaving did pique his interest in the front door, but that’s not what this post is really about. Take a closer look at this scene. My strapping young son is wearing hello kitty crocs. He found them in the collection of out grown shoes at the bottom of his closet a few weeks ago and today he saw fit to wear them. Zizza was so amused by his choice of foot fashion she imitated as best she could by choosing his flip flops to complete her own outfit. 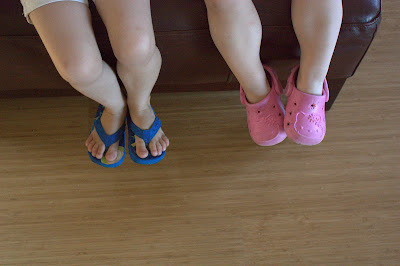 With the feet of my children thus shod we were off to run our errands. 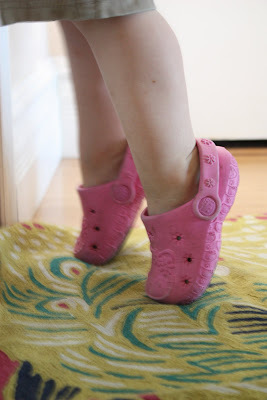 I must admit, I do have a bit of a problem with Enzo’s new love of the Hello Kitty Crocs. You see, my rubber foot wear of choice is and will ever remain the flip flop. I bought the Hello Kitty’s for Zizza as sort of an experiment. They’d stay on better than flip-flops I thought, and also there would be less worry over stubbed toes… so I bought them. They were quite convenient to have around and Zizza surely loved them. The fell short in my book though and here’s why. A good deal of foot sweat is produced in such a shoe and the ventilation holes seem to let in more dust than air. The sweat and the dust combine to form a fine black sludge the likes of which haven’t been seen since jelly shoes. That sludge creeps beneath the toe nails of the childish feet and stays there. No amount of scrubbing, can dislodge it. The nails can’t be trimmed short enough to eliminate the sludge trough. The only remedy is to wait for the nails to grow long enough that the sludged portion can be trimmed away. Zizza spent a whole summer and part of a fall with black edged toe nails. I was so happy when those sludge producing monsters grew too small and started giving her blisters so she’d stop wearing them. As amusing, endearing and sweet as it is to see Enzo’s masculine little bricks of feet stuffed in those pink Hello Kitty shoes, I don’t think I can stomach another long term blackening of a child’s toe-nails. Heaven help me, I just don’t have the strength! I’d be more than happy to make them disappear if it would make you happy.